We’d love your help. Let us know what’s wrong with this preview of Our Super Adventure Vol. 1 by Sarah Graley. To ask other readers questions about Our Super Adventure Vol. 1, please sign up. I’m speechless. But in the wrong way. This was the worst comic I’ve ever read. The author is obsessed with fart/poop jokes. Come on, it is so cringe. Maybe I don’t have this kind of humor, but let's be honest, I don't mind at all. The drawing style was okay, but the “jokes”... 1.5 stars because of the art style. Oh. My. God. Y'all, my freaking RIBS hurt. I've always loved Sarah's webcomics, but this collection was the best of the best and I seriously laughed so hard through the entire book. Sarah and Stef remind me SO much of myself and my spouse, and I literally was just making my poor spouse look at so many of these comics like, "Look! It's us!" If you can't relate to the way these two act around each other, you might not find it as hilarious as I did, but I honestly think anyone will be able to find something to love here. This is a cute collection of web cartoons focusing on the relationship between a couple and thier four cats. It has plenty of big eyed cats, farts and video games. It is throughly modern, and funny at times. As usual, your millage may vary. Humor is subjective. I didn't find the couple jokes to be cloying, which was good. And I even enjoyed the cat/fart/couple/fart jokes. There is an interesting bit in the back of the book, where the artist shows how much her style has changed. Lovers of cats will This is a cute collection of web cartoons focusing on the relationship between a couple and thier four cats. It has plenty of big eyed cats, farts and video games. It is throughly modern, and funny at times. Utterly adorable diary comics from the creator of Kim Reaper. I say 'adorable'; if your own home life doesn't include this much fond mockery of your partner's tendency to behave like a cat, or quite such heavy pizza consumption, then you might well find it sickening rather than relatable. But your questionable life choices are hardly my problem. Seriously, though, it is so incredibly refreshing to read sketches from a couple's life which find the humour in them being obviously really into each o Utterly adorable diary comics from the creator of Kim Reaper. I say 'adorable'; if your own home life doesn't include this much fond mockery of your partner's tendency to behave like a cat, or quite such heavy pizza consumption, then you might well find it sickening rather than relatable. But your questionable life choices are hardly my problem. Seriously, though, it is so incredibly refreshing to read sketches from a couple's life which find the humour in them being obviously really into each other, as against all those columns which rely on bickering for laughs and just make you wonder weekly why they've not split up yet (mentioning no names, Tim Dowling. There was a small but measurable improvement to my quality of life once I realised I could just skip past him in the Guardian mag). There's also a significant amount of farting. A collection of wonderfully drawn and brightly colored comics setting new goals for relationships. Purfect for all cat lovers and pizza lovers (which, I hope includes everyone), people in relationships, comic lovers, life lovers, world lovers, oh and space lovers too! (...did I miss anything?) . At the end some comic strips by Sarah are shown which were made a few years back along with their redrawings which greatly indicate how her style has bloomed and flourished. It was a lovely read. I tried A collection of wonderfully drawn and brightly colored comics setting new goals for relationships. Purfect for all cat lovers and pizza lovers (which, I hope includes everyone), people in relationships, comic lovers, life lovers, world lovers, oh and space lovers too! (...did I miss anything?) . At the end some comic strips by Sarah are shown which were made a few years back along with their redrawings which greatly indicate how her style has bloomed and flourished. 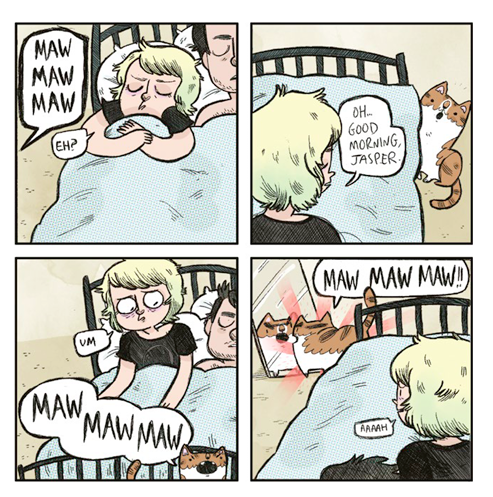 Super cute slice of life comic strips featuring cats, farts and general fluffy nerdiness. This is just pretty much the perfect capture of being in a couple. It's cute and fun. Thanks to Netgalley and the publisher for making this available on Netgalley. Yep, you can jump straight on and download the epub! OK, so I've seen Sarah's comics on Facebook, and I always adore them! Her relationship with Stef reminds me so much of mine and Bowie's, especially the way we talk to each other and the cat situation (add in three dogs and you've got it to a tee) All her comics are funny and relatable, and her drawing style is just so,so cute! I loved seeing these in a collection. It w Thanks to Netgalley and the publisher for making this available on Netgalley. Yep, you can jump straight on and download the epub! I'm all for supporting books like this. I really enjoy reading comic strips by artists who choose to either narrate their lives in a funny or sarcastic way, or portray their life as an artist, or show parts of their relationship, or show all the weird stuff we do or say to our pets. And this book had pretty much most of the aforementioned and I enjoyed it. The entire collection was quirky and funny. I found myself laughing at a lot of the comics and what adds to that is how she chooses to draw he I'm all for supporting books like this. I really enjoy reading comic strips by artists who choose to either narrate their lives in a funny or sarcastic way, or portray their life as an artist, or show parts of their relationship, or show all the weird stuff we do or say to our pets. And this book had pretty much most of the aforementioned and I enjoyed it. The entire collection was quirky and funny. I found myself laughing at a lot of the comics and what adds to that is how she chooses to draw her character's facial expressions. I loved the art style and it was overall a fun read. I absolutely adored meeting Sarah, Stef, Wilson, Pixel, Pesto, and Toby. The scenes were relatable and had heart. If you have cats, have been in a long-term relationship, and/or fart, you should give this a read. That said, some of the panels seemed related but were many pages away from each other, and other panels lacked an ending or punch line. I think this collection could be made stronger with some rearranging and editing. I received an advance copy from the publisher via Netgalley for review I absolutely adored meeting Sarah, Stef, Wilson, Pixel, Pesto, and Toby. The scenes were relatable and had heart. This was really cute! I've been a fan of this series on the internet for a while, so I'm not surprised that I enjoyed this bind-up. 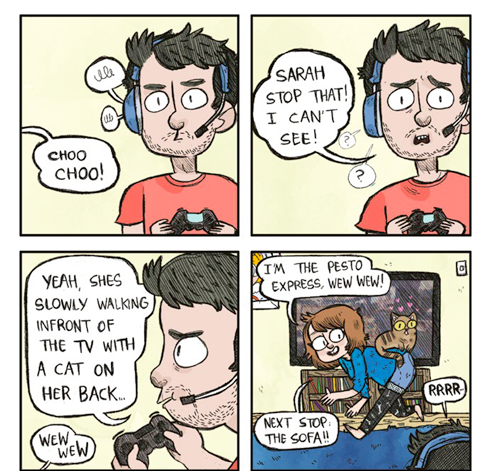 These short comics depict short snapshots of the life of Sarah, Stef, and all of their many cats. Many of their stories are heavily reminiscent of my own relationship, which is part of why I connected so well with the story. It's a pretty quick read, but I would highly recommend it to anyone that's a fan of webcomics. I received a copy of this title from NetGalley. A This was really cute! I've been a fan of this series on the internet for a while, so I'm not surprised that I enjoyed this bind-up. 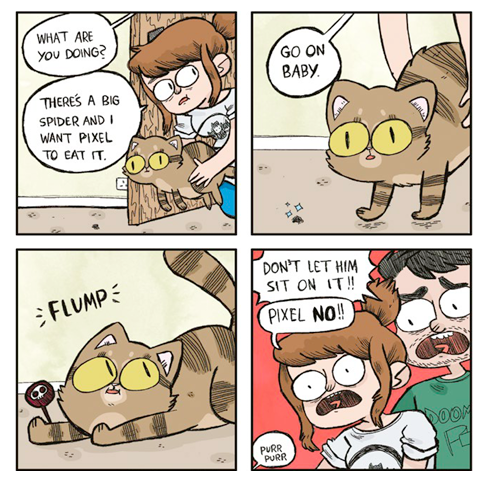 These short comics depict short snapshots of the life of Sarah, Stef, and all of their many cats. Many of their stories are heavily reminiscent of my own relationship, which is part of why I connected so well with the story. It's a pretty quick read, but I would highly recommend it to anyone that's a fan of webcomics. 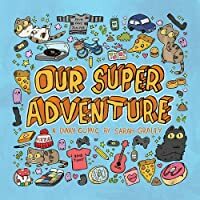 For fans of the "Our Super Adventure" web comic this collection is bliss. Having so many creative, funny and entertaining comics at your fingertips is the best. I've read a few of these online and had nit had the chance to read so many of them in one sitting. While hitting the "share" button is harder in book form I now have the perfect gift idea for quite a few people in my life who are also fans. I am possibly the easiest mark in the world for autobio comics, so this was right up my alley. It's a great everyday diary comic about the relationship between Sarah and her partner Stef, as well as their assortment of adorable kitties. Much as in life, I was surprised at how many farts were contained in this book. Adorable and a lot of fun. This was an adorable collection of comics that really portray what a long term relationship is like. It is not always pretty but it is always loving. Very cute overall I loved reading this title. I first came across Sarah Graley's work through Instagram and I've been following her ever since. Her comics are funny, cute, weird and altogether - AWESOME. Call me a Greedy Pig but 200 comics weren't just enough for me. What’s not to love, the two main characters are adorable and let’s not forget the four cats - Who can resist them! It’s such a fun, cute, and hilarious book! I loved every minute of it! It was a fun read though unfortunately, I didn't fully enjoy some comics. I found some comics not my type (farts, belly buttons, poop (!) etc...). On the other hand, seeing the artists' style changing over the years was interesting. Worth reading? If you are not into such jokes as I mentioned above, it is not your book. To see more reviews check out MI Book Reviews. It appears that every single comic I liked the first dozen times I saw them were included in this book. That isn't a bad thing. The bad thing was those were the only comics that I even mildly li To see more reviews check out MI Book Reviews. It appears that every single comic I liked the first dozen times I saw them were included in this book. That isn't a bad thing. The bad thing was those were the only comics that I even mildly liked. This book was just constant poop and fart jokes. I have never enjoyed those jokes, even as a kid. I am just shocked at the sheer number of those jokes. There was no substance at all. There was just poop and fart. That was it. There were a few comics that had the potential to be funny, but they were just so overshadowed by everything else that I couldn't enjoy them. There were a few fart jokes about the cats that could have been funny, but there were just so many fart jokes that I was annoyed before they appeared. I don't recommend this book to anyone, unless they have the humor of an eight year old boy (though the eight year old boys I know also wouldn't have found this book funny). Thanks to Netgalley and the publisher for an ARC in exchange for an honest review. This was alright. It's the kind of thing a lot of people will like, especially I think if they're in a long term relationship, then this might be more relatable. For me though I didn't relate to a lot of it (though at one point Sarah does get really excited about the idea of cute couples cosplay and starts coming up with ridiculous suggestions for couple cosplays that aren't couples and that's 100% me). I liked the Thanks to Netgalley and the publisher for an ARC in exchange for an honest review. I liked the focus on cats, I'm a cat person so that's nice, but if you're not a cat person that might not be fun to read about. The art was alright, not really my kind of thing, but definitely not bad and I think it added to the comics. The comics were generally not that funny to me, I didn't laugh at any of them, and I think they're meant to be funny because some of them seem like they have a punchline at the end, so that kind of failed for me. Our Super Adventure: Press Start to Begin is based on one of those webcomics that you immediately recognise (though you totally can't remember the name of it) and have probably seen pop up in your Facebook feed at least a dozen times over the past year. Featuring 200 of the diary comics from artist Sarah Graley (drawn between 2012-15) about Sarah, Steff, and their four adorkable cats, Graley's latest book shares some of her most popular comics in one handy coffee table book. 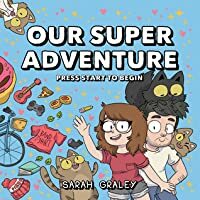 Sweet and funny and, Our Super Adventure: Press Start to Begin is based on one of those webcomics that you immediately recognise (though you totally can't remember the name of it) and have probably seen pop up in your Facebook feed at least a dozen times over the past year. 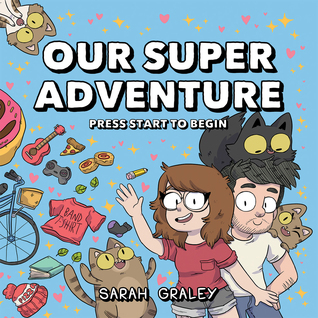 Sweet and funny and, well, just all-around awesome to be honest, Graley's comics embody that brutal honest-but-ridiculously-in-love kind of relationship that you only get once you've experienced it yourself. If you're a fan of her webcomic, you'll probably love this book. If you haven't come across Graley's comic online before...where have you been. Go and binge-read them now. The solicit for this book compared it to Kate Beaton and Sarah Andersen. While it may svisually reflect those two, it's lacking Beaton's wit and literary references, and Andersen's insightfulness. This is a diary comic with the same flat jokes over and over. It felt like an anti-American Elf: The Collected Sketchbook Diaries, Vol. 1. If you like diary comics (and I do like a few), this may be right up your alley, but I found it to twee and scatological. First I would like to thank Onipress and NetGalley for the chance of reading this book in exchange of a honest review. Secondly, I would like to say I love Sarah Graley, Stef Purenis and their 4 cat children. I actually follow the comics online for months now over the Our Super Adventure site, so I was really excited when I saw the book! Sarah's art and their story is such a funny and real gem! Her relationship with Stef is so great, and you really feel the love and companionship between them in t First I would like to thank Onipress and NetGalley for the chance of reading this book in exchange of a honest review. Sarah's art and their story is such a funny and real gem! 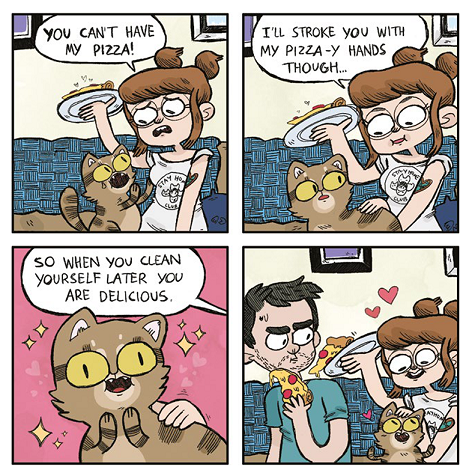 Her relationship with Stef is so great, and you really feel the love and companionship between them in this comics, from all the jokes about pizza, cats, and all the farts! Really, the truest couple in comics I follow are them and I really hope one day to be in a relationship as funny and nice as them! And of course, adopt 4 cats as adorable as Wilson, Pixel, Toby and Pesto! Live the dream! Thanks to Oni Press and NetGalley for access to this ARC. I feel the same way about this comic collection that I do about Catana Comics' collection. I have seen some of Sarah's work before on social media and found it cute and funny. This also got a laugh or two out of me at a couple of bits. However, overall, this trend of comics is super creepy read as a whole volume. It seems so weirdly co-dependent and doesn't appeal to me at all. Maybe I'm heartless and have no human feelings? Also, way too Thanks to Oni Press and NetGalley for access to this ARC. Me, upon finishing: This is everything I have ever needed. Yes. This is pretty darn tootin' good. I received a free eARC from NetGallery in exchange for an honest review. I was already a fan of Sarah Graley's work, so I got very excited when I found out about her book! I was not disappointed!! 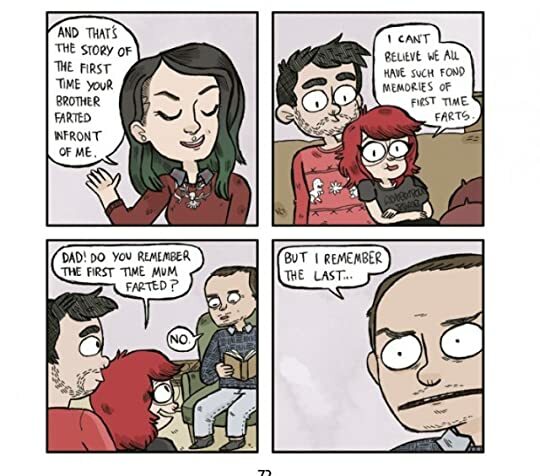 I adore this comic look into her and Stef's life and found myself frequently poking my husband saying "Look! It's us!" She captures the oddities in their comfortable relationship so well, I think every couple can see a bit of themselves reflected. 3 Stars - It Was I received a free eARC from NetGallery in exchange for an honest review. An ARC electronic copy of this book was provided by Oni Press via NetGalley in exchange for an honest review. I recommend this comic for people who like banter and poop/farts humour. This wasn't for me. The art work is cute and consistent, the book is well designed, although it is just a collection of random vignettes put together. What really didn't work for me was the type of humour in this comic - even if I actually laughed with a few of the scenes - I generally found it mean and dirty. Cartoons putting a couple in the front place has we follow them up in daily their daily routine of life. There are a lot of those popping out around recently and unfortunately even if this one is alright, it is not the best by far. 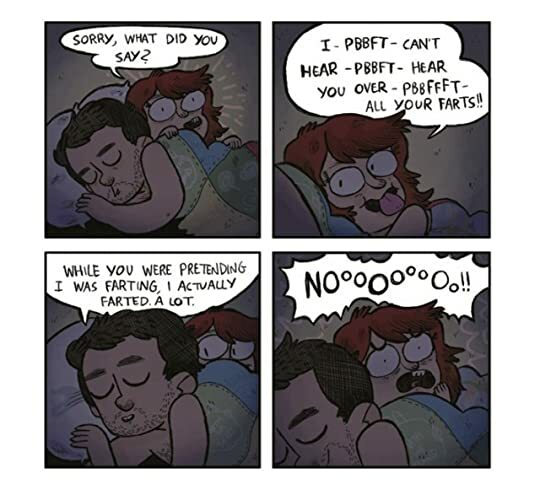 I didn't really see myself in this couple and I think that's the point of this style of comic, to see yourself, your couple, into them and not being able to do it sure make it less funny. I am already a fan of Sarah Graley and Stef Purenins as I follow their adventures on social. 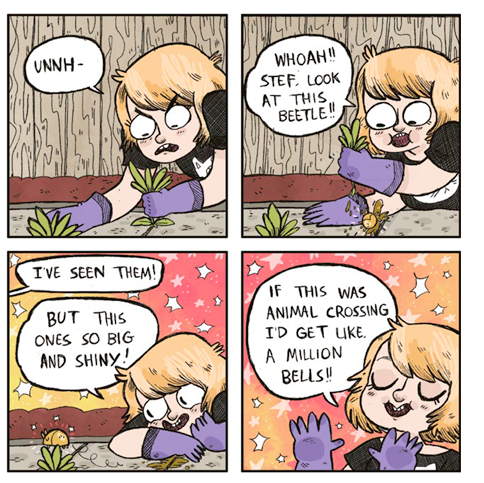 I adore the quirky art style and short, too the point, laugh out loud comics. There were a number of scenarios in the comics where I see my hubby and myself. Heartwarming and funny. Ended to soon and made me wanting more. ** I received a copy of Our Super Adventure Vol. 1 by Sarah Graley and Stef Purenins via NetGalley in exchange for an honest review.